For many of us, life without chocolate would be drab and desolate. Good news: recent research has shown that chocolate is good for you and can actually extend your life! That means that I will probably live to be 120. 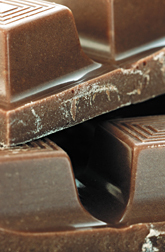 A little more information is needed to maximize the health effects of chocolate. As in all things, all chocolate is not alike. The primary contributor to the positive impact of chocolate is an obscure thing called flavonoids. Flavonoids are found in many berries, red wine and green tea. So I may live to be 130, between the chocolate and the red wine. Flavonoids are antioxidants. That means that they inhibit the oxidation of other molecules. That is a good thing, because oxidation releases free radicals that cause damage to our cells. This damage is associated with aging (boo!) and in more extreme cases, cancer, stroke, heart disease and neurological disorders. 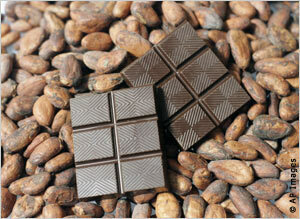 To get the most out of your daily chocolate, choose chocolate that is rich in flavonoids. That means dark chocolate. Milk chocolate only has about 25% of the flavonoids of dark chocolate, and white chocolate has no flavonoids at all. The best yard stick for flavonoid content is the percentage of cocoa in the chocolate. Shoot for 70% cocoa, at least. You get a nice taste and plenty of wonderful flavonoids in every bite. Be aware that very high levels of cocoa can taste bitter or dusty to some people, so sample before you make a large purchase. Sample anyway, it's just a sensible thing to do! A German research study found that people with high blood pressure saw an appreciable drop in their blood pressure if they had a daily serving of chocolate. A follow-on study in the H.S. found that the drop in blood pressure was accompanied by a 10% drop in low density lipoprotein, the "bad" cholesterol. 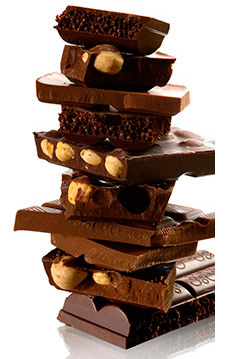 Several studies have also tied chocolate consumption with improved mood and mental outlook. Really sorry I missed out on that study! Chocolate is a wonder drug. It improves your blood pressure and cholesterol readings. It improves your mood and feeling of well being. It slows aging and fights many diseases. It pairs well with red wine, another healthful substance. I think I'll head on down to that Scharffen Berger chocolate shop and get some health food right now!